AHEAD of the Lok Sabha polls, a huge amount of bomb-making material, and some explosives and weapons have been seized from a house in Pune district of Maharashtra, police said on Wednesday. One person, identified as Rajaram Abhang (71), was arrested following the seizure, an official at the anti-terrorist cell of Pune rural police said. 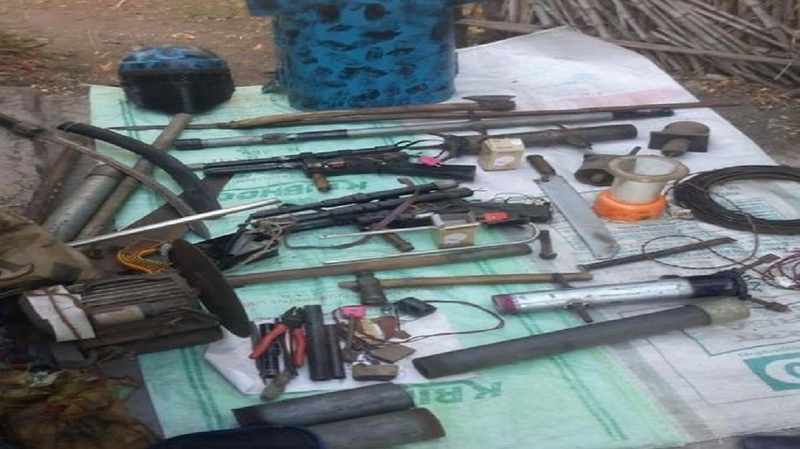 “Acting on a tip-off, the police on Tuesday raided Abhang’s hut located at a farm in Pimpalwadi village in Junnar tehsil where a large amount of bomb-making material, country-made pistols, pipe bombs, some detonators and gunpowder were seized,” he said. Besides, some sharp weapons, electronic equipment including batteries, an iron armour and a metal helmet were also recovered from the place, he said.Superintendent of Police Sandip Patil said that an investigation was on into the seizure. A case was registered under relevant sections of the Indian Penal Code and the Arms Act, the police said. Another official said in 2003, Abhang had allegedly attempted to kill his wife as he suspected her character. “He had placed a crude bomb on a motorcycle and in the explosion, his wife and three children were injured. Abhang was subsequently arrested,” he said. In the blast, several villagers had sustained injuries. Following the incident, his wife left him. Police have constituted a team to find out ‘from where and for what purpose’ the accused learnt to make bombs. Further investigation is underway.